The Midwest has long been a major source of innovation when it comes to feeding the world, so it’s no wonder that the same state where Nobel Peace Prize winning agronomist Norman Borlaug was educated is now delivering on the promise of urban indoor aquaponics. The St. Paul, Minnesota company Urban Organics, which uses aquaponics to raise fish and grow leafy greens, has already proven the viability of an idea that’s been getting national attention: year-round indoor farming. In fact, Urban Organics has been so successful in its pioneering approach that it recently added a second larger location to meet skyrocketing local demand for its fresh arctic char and salmon, and organic greens including bok choy, kale, lettuce, arugula, chard, and spinach. 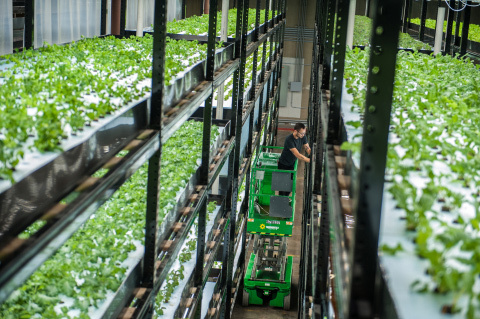 In a sector of the food industry seeing substantial growth of new entrants, Urban Organics offers a highly differentiated approach to vertical farming that addresses market demand for both local and organic produce and protein. Unlike typical hydroponic farming operations, the Company can supply produce that is USDA-certified organic by using solids produced in its fish culturing system as the nutrient source for the produce. Using natural waste products from one system as the primary input of another has substantial economic advantages and represents a far more environmentally sustainable and resource conservative approach to urban food production. In 2014, the company opened its first indoor urban aquaponics farm inside an old St. Paul brewery complex — the former Hamm’s Brewery. Its 8,500 sq. ft. became home to a fully-operational farm which housed four 3,500 gallon fish tanks with 4,000 hybrid striped bass plus herbs and leafy greens—one of the largest and most advanced aquaponics facilities in the country. Local, national and international interest followed; England’s The Guardian called the farm one of 10 innovative concepts from around the world. The Hamm’s farm proved the concept, as area restaurateurs and grocers demanded more ultra-fresh, ultra-local product than the location could provide. Global water company Pentair, with its main U.S. offices in Minnesota, was an early supporter of the Hamm’s location — designing, engineering and installing the innovative system with its water filtration and reuse technologies. After the success of the Hamm’s location, Pentair and Urban Organics joined forces and expanded to a larger space in another unused urban brewery building—the 87,000 square foot Schmidt complex, which is in the middle of a revitalization including artists’ condos and a planned food hall. That new Urban Organics Schmidt brewery location opened earlier this summer. Its 87,000 sq. ft. are home to 14 fish tanks and 50, 5-tier towering racks of greens, and when it reaches full capacity later this year, it will provide 275,000 lbs. of fresh fish and 475,000 lbs. of produce per year to the surrounding region. The USDA-certified-organic farm has created jobs, brought life back into abandoned buildings, provided a global model for indoor aquaponics farming, and done it all without the use of pesticides — and while using significantly less water than traditional methods to grow produce. Urban farming is an extremely competitive endeavor, but Urban Organics continues to add products and customers. Earlier this summer, the farm rolled out nine different types of packaged greens and salads, now distributed through regional coops and grocery chains. And by next summer, arctic char growing in its tanks will be ready for harvest. Local health care provider HealthPartners, the largest consumer-governed health care organization in the nation, is now including Urban Organics greens in patient meals and serving them in its cafeterias. And restaurants, like Birchwood Café, are serving the greens as well. Urban Organics is focused on reinvigorating our current food system by providing hyperlocal, long-term sustainable, year-round USDA certified greens and sustainably-grown fish in urban environments. Founded in St. Paul’s historic Hamm’s brewery, and now expanding to St. Paul’s historic Schmidt Brewery, Urban Organics has been featured in numerous national media outlets and has been highlighted by The Guardian as one of the most innovative urban farm projects in the world. To learn more, visit urbanorganics.com.